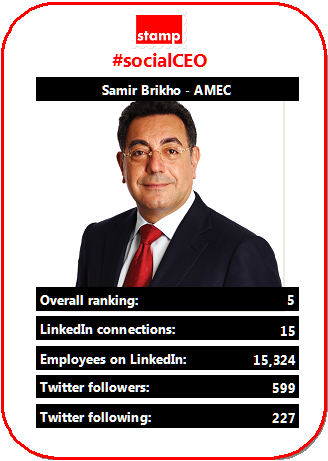 Continuing our countdown of the top ten #socialCEOs (based our October 2013 report data) and at number 5 engineering consultancy AMEC’s Samir Brikho. Samir is a CEO who tweets, and the nature of his tweets appear to be directly from the man himself (rather than the ghost written tweets of a PR firm). Occasional motivational quotes, updates on the things he’s been doing, and even the occasional selfie. He’s not a LinkedIn user, though – he has an account, but it’s been dormant between our summer and autumn surveys with only 15 connections. AMEC have a solid corporate social presence with Twitter and LinkedIn both actively managed..
Catch up on the rest of the top ten so far.